Trading in dark pools. The strange life of a Georgian bullion banker. The mysterious sounding term ‘dark pools trading‘ is not a new idea. Certainly, a version of it was around in Nathan Rothschild’s day and was one of the underlying principles that enabled him to amass a fortune of over £3.5 millions during his lifetime. One of the main advantages for investors who make use of dark pools for buying or selling is that trades can be offered to a select few without showing your hand to others. In this way a trader can avoid market reaction – neither the size of the trade nor the identity are revealed until the trade is filled. Fables and legends and folklore persist concerning Nathan and how he managed to create his fortune. The stories and legends about Nathan range from the outrageous to the impossible. In one extraordinary account he supposedly stood next to Wellington at the battle at Waterloo, then made a dash to the coast using a string of horses to board a fast boat back to London. Once in the City, he traded and made a fortune before news of the victory arrived. 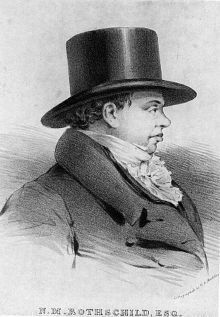 In another story we hear how, on 19 June 1815 in the late afternoon, a Rothschild agent named Rothworth jumped into a boat at Ostend. In his hand he held a Dutch gazette still damp from the printer. By the dawn light of June 20th Nathan Rothschild was already waiting at Folkstone harbor and let his eye fly over the lead paragraphs. A moment later he was on his way to London (beating the official envoy by many hours) to tell the government that Napoleon had been crushed. He then made his way to the Stock Exchange to make use of the information ahead of other traders. According to Professor Niall Ferguson, author of ‘The House of Rothschild: Money’s Prophets 1798-1848’ the ‘Waterloo Myth’ as the source of Rothschild’s wealth doesn’t add up. Even if Nathan had advanced knowledge of the victory the total volume of trades available over those first few critical days could not have generated more than £7,000 in profits. He also argues that Nathan had invested heavily in gold believing the war was going to be a protracted affair. A mythology grew up around this quiet and withdrawn banker who grew in power with a reputation that was probably more resentful than accurate. In another story we are led to believe that on the morning after the battle, a nervous looking Rothschild entered the London Stock Exchange, took his usual place at the Rothschild Pillar, and began quietly dumping his huge portfolio of consols. The word quickly spread: “Wellington lost! Rothschild knows!” The decline soon turned into a rout, with consol holders selling off in the free falling market. At the nadir of this collapse, upon a silent command, Rothschild agents quickly began buying back consols at a fraction of their former value. By closing time he’d bought back many, many more than he’d sold. But we do love epithets and intrigues. The comment that ‘Rothschild knows’ fueled hectic selling on the floor and over the years the story that he panicked the market into dumping consols became more embellished and cartoonish. The Rothwell story mentioned above is intriguing because of the times, date and the port of arrival – Folkstone. 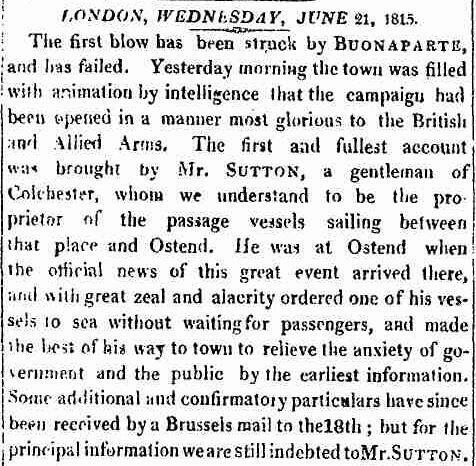 Newspaper reports within the first week of Waterloo suggest that there were others who knew the outcome and made a dash to England, probably arriving before Rothschild’s intelligence network or within a matter of hours. A certain Mr Sutton is credited in the London news feed with offering the most complete account. He is an intriguing character. Sutton goes to great lengths to get the news from Ostend to Colchester and make it public. Unlike the secretive banking agents in the pay of Nathan Rothschild – his intelligence network was one of the major strengths of his banking house and a key differentiator that other firms couldn’t match – it doesn’t appear that Mr Sutton had a financial motive. Sutton is a ‘gentleman’ of Colchester. He owns a successful passenger company operating between Colchester and Ostend. From the report we read that he is anxious to relieve the anxiety of the government. Perhaps this is where we can speculate about a motive for Mr Sutton’s decision to order one of his vessels to sea without any passengers. A man who could travel faster than official channels was a valuable asset to have on the books and maybe a lucrative government contract could be obtained. We can also assume that other accounts and details would have been smuggled into the country very quickly. Smugglers enjoyed a reputation as fast couriers. They were a reliable method of getting a sensitive ‘package’ to its destination. Government agents often used smugglers to deliver their intelligence and throughout the Napoleonic Wars, smugglers would be employed to carry small payloads in much the same way that Britain relied on Rothschild to deliver coin to Wellington’s army. Sometimes their contracts were with the British, other times they made a good living working for Napoleon and working out of safe ports like Dunkirk and Gravelines known as the ‘City of Smugglers‘. But none of them could do it on the scale of the Rothschild’s. How Nathan Rothschild probably made his fortune. Rothschild became pre-eminent in bullion trading and as a foreign exchange dealer. The bank was so successful that it became known as ‘The Bank of England’ and indeed, it did bail out the government on more than one occasion. This is where Rothschild’s connection with Wellington does come into play. After years of campaigning, Wellington started to advance North across Spain in 1814. He had driven the French back to the Pyrenees, but was in desperate need of money to pay his troops. 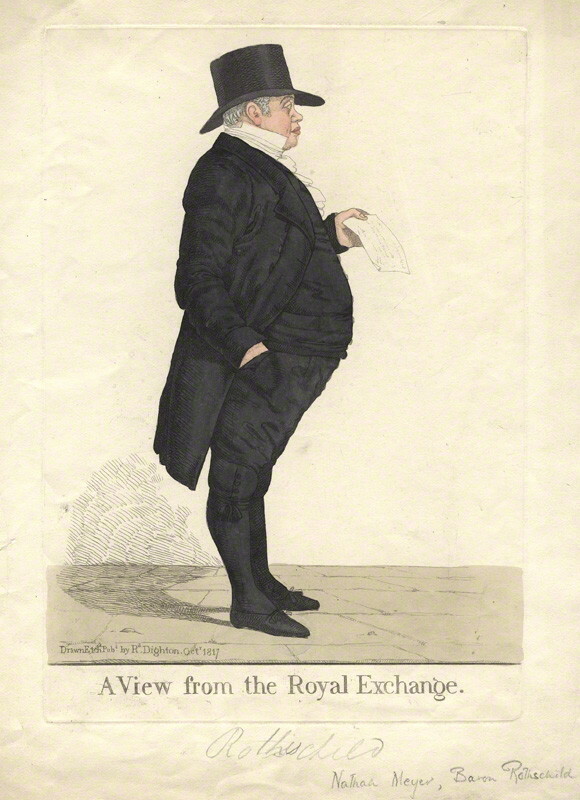 Nathan Rothschild, still a relative newcomer to British banking, was commissioned by the British Government to supply the Duke with the necessary funds, and together with his brothers he set up a network of agents to buy up coin and transfer it to Wellington in the form of local currency. It is believe that the firm of N M Rothschild was approached because the Government had already failed to establish a similar network of its own and had been let down by other more established London firms. The Rothschild courier and communications network had gained a justifiable reputation for speed and reliability – just what was needed to succeed. There is an image of Nathan Rothschild leaning against what became known as ‘Rothschild’s Pillar’ at the Royal Exchange. Here he stands at his pitch, alone, but once in a while someone comes over from the floor and within a few moments a deal is struck. His expression gives away nothing. This is the image that borrowed on the legend but we can also see how it was used by his critics to imply a sinister power where “no sign of life (spirit) is in his eyes”. In today’s financial world, Nathan would have been the success of the age. In his own time, he was the richest man in the country with a trading and intelligence network stretching across a rapidly changing Europe. Herries was referring to Nathan’s support going back to 1811 when he undertook to transfer money to pay Wellington’s troops on campaign in Portugal and Spain against Napoleon. But the vision for the bank came from his father, Mayer Amschel Rothschild. Within a short time Mayer moves from being a Frankfurt banker and coin dealer to become the world’s richest man with financial operations run by his five sons in London, Paris, Vienna, and Naples, as well as Frankfurt. He is referred to as the “founding father of international finance”. Nathan Rothschild was the most successful of his sons. Whether or not the Bank had established semiphore signalling or a battery of carrier pigeons to send and deliver messages across the Channel is probably of secondary importance. It is what the Rothschild dynasty did with their information that distinguished them. Nathan’s knowledge, news and intelligence system spread across Europe. His financial and political view went far beyond an island called Great Britain. Nathan Rothschild was also prepared to take risks. Even his brothers criticized his risk-taking. Nathan was a workaholic and opportunist. He could see an opportunity and he had the skills and resources to maximize on these while offsetting many of the risks. Nathan saw beyond Britain. His family business was Euro-centric. That is what made him unique and it was pivotal in establishing a power-base that no other bank could compete against. Within a few short years of moving from the textile industry in Manchester, Nathan had built a profitable and influential merchant bank in London. The firm grew on such a scale that established traditional banks – even those that enjoyed a particular clientele, specialisation, and reputation – couldn’t compete. At the height of its power, Rothschild was seen as the real Bank of England, propping up the institution against collapse. But Nathan was not popular and made enemies. He was an opportunist and chancer with little concern for the state of the nation. He represents a new breed of financier and investor. The Rothschilds could see what was really at stake after Waterloo: The outcome would determine who would lead a rapidly changing Europe – France or Britain? Any bank that was influential in the key financial markets of Europe could exert enormous influence and pressure over this. Various deals were struck and many ‘dark pools’ of trading are probably still locked away in the vaults of Rothschild’s history. The brothers Rothschild were better placed than any other banking enterprise in Europe to profit from the new Europe.